The game's main character, Pixie, loses her way in a magical forest one day and needs your guidance to return home. To succeed, gamers must play and advance in each game level, which will ultimately send Pixie on her way home, safe and sound. 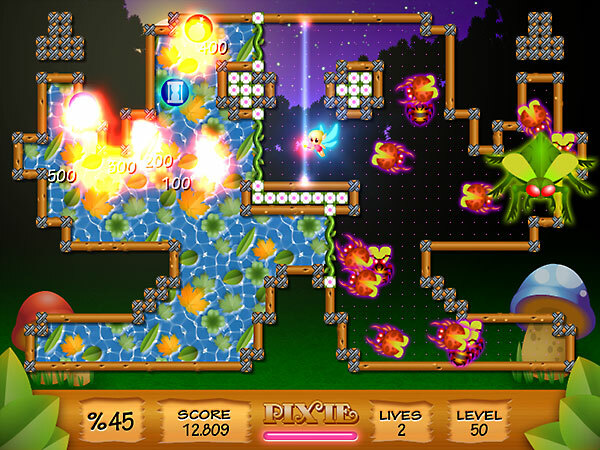 For each level, the objective of the game is to fence off or claim a majority of the playing field. Click on the playing board and send a magical vine to block off areas of the board. Help Pixie find her way home through the dark forest and back to her friends. Celeron 1GHz, 128MB RAM, 64MB 3D Video, 40MB HD Space + DirectX 7 or newer. ...... them get to you. Send magic vines to fence off a majority of the board and fill it with happiness. * Excellent gameplay and lots of fun for all the family !! This is a fun family puzzle game. Qweas is providing links to Pixie PC 2.1 as a courtesy, and makes no representations regarding Pixie PC or any other applications or any information related thereto. Any questions, complaints or claims regarding this application Pixie PC 2.1 must be directed to the appropriate software vendor. You may click the publisher link of Pixie PC on the top of this page to get more details about the vendor.